As one of the greatest and most influential artists of the 20th century, Picasso is known for co-founding the Cubist movement, the invention of constructed sculpture, the co-invention of collage, and for the wide variety of styles that he helped develop and explore. Exceptionally prolific throughout the course of his long life, Picasso achieved universal renown and immense fortune for his revolutionary artistic accomplishments, and became one of the best-known figures in 20th-century art. Nowadays, four works by Picasso are among the ten most expensive paintings in the world. painter and sculptor (1881-1973). 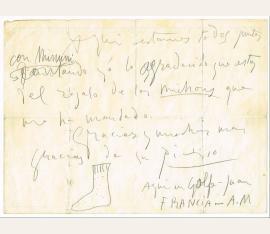 Autograph letter signed „Picasso“ with a small sketch of a sock. Golfe-Juan. Folio. 1 page. Pencil. Expected folding. 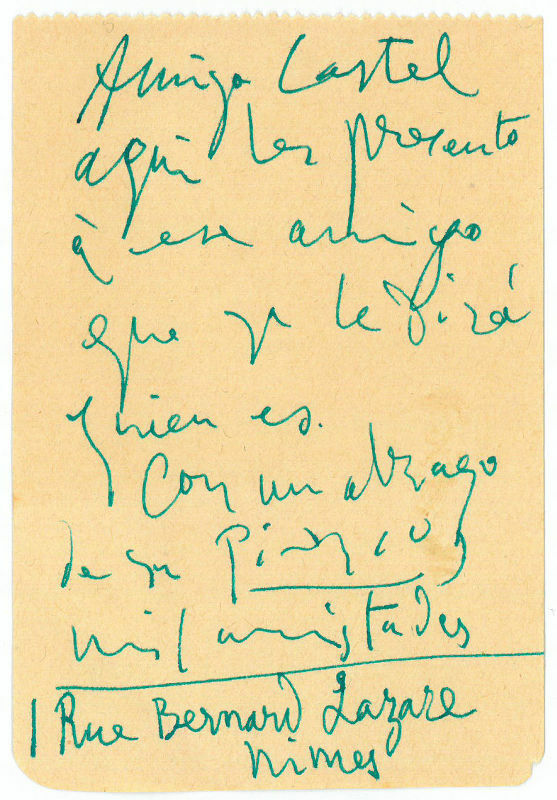 In Spanish on the verso of a printed menu to an unidentified friend: „Aqui estamos todos juntos con Minuni“ (the torero Francisco Reina called „El Minuni“). 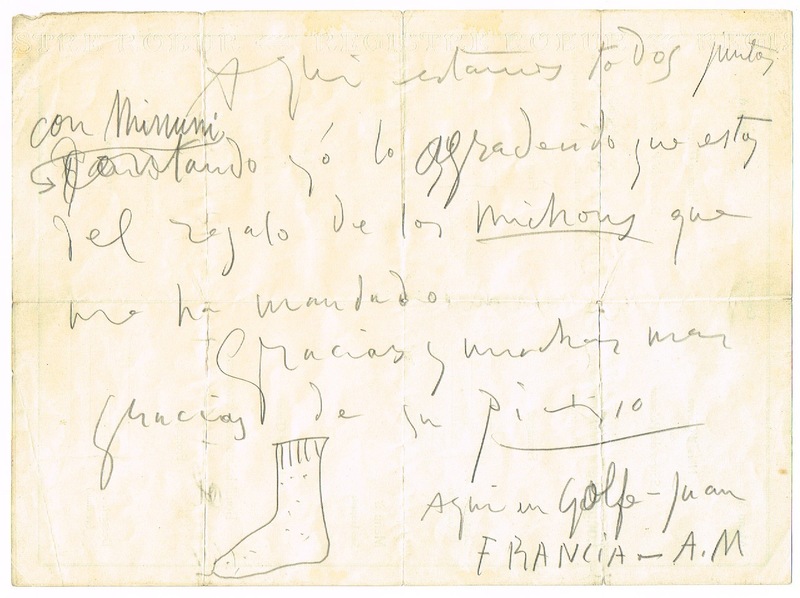 Picasso is thanking the recipient for sending the „michons“ (socks in Catalan) and is drawing a sock. painter and sculptor (1881-1973). 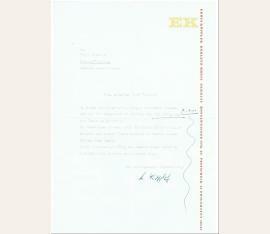 Signature on a typed letter addressed to the artist. Aix-en-Provence. 4to. 1 p. Envelope. 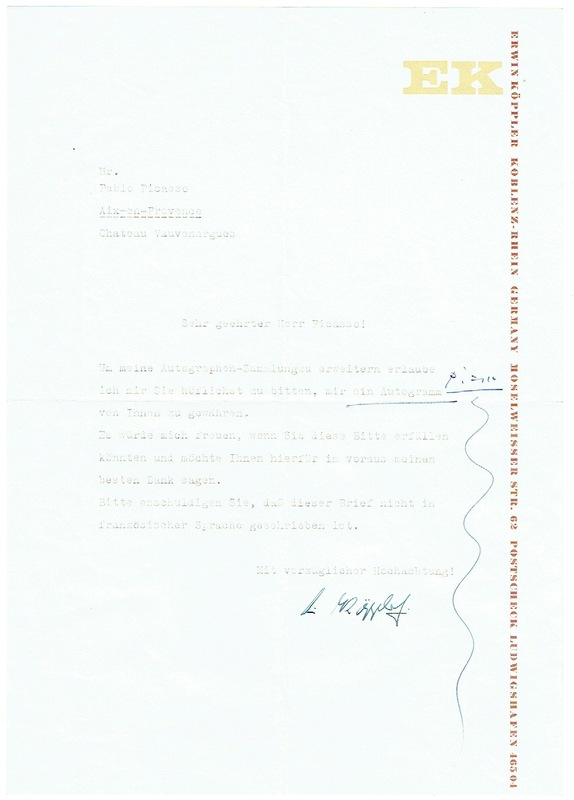 Letter addressed to the artist in German language by an autograph collector. - The artist underlined the word „ein Autogramm“ and signed next to it. painter and sculptor (1881-1973). Autograph note signed. "1 Rue Bernard Lazare, Nîmes". 107:74 mm. 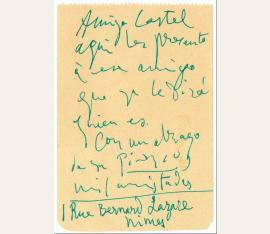 1 p.
In Spanish, to André Castel: "[...] Con un abrazo de su Picasso mil amistades [...]". 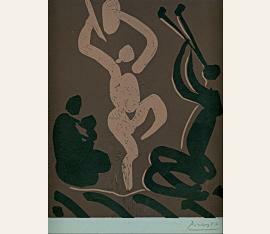 painter and sculptor (1881-1973). Photograph signed. (Antibes. 235:180 mm. Some addenda (s. b.). 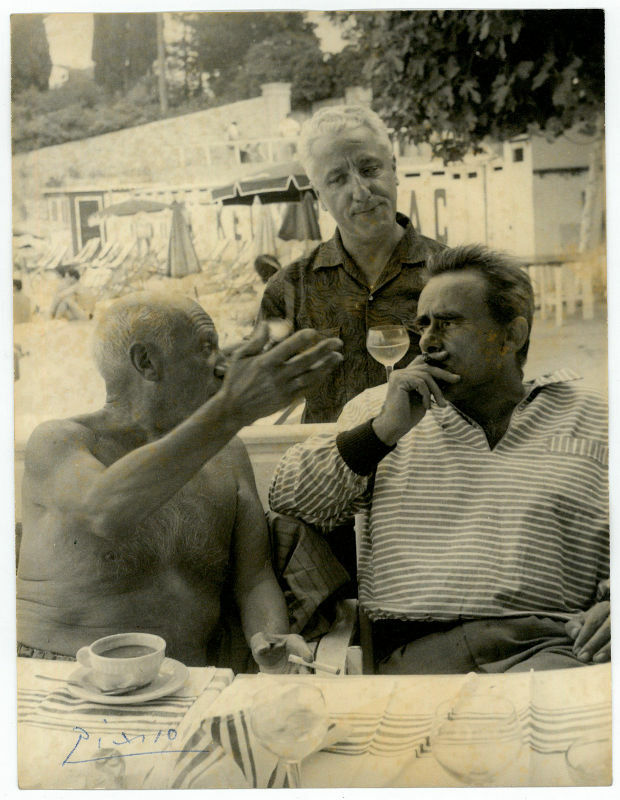 Photograph by Picasso, the image depicting the painter outdoors, in a half length profile pose, seated at table having a coffee alongside Henri-Georges Clouzot, both smoking. 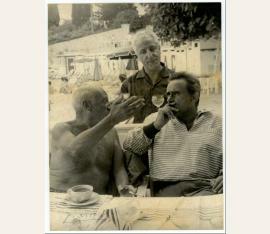 Picasso with his arm up explains something to Clouzot who closely listens to him. 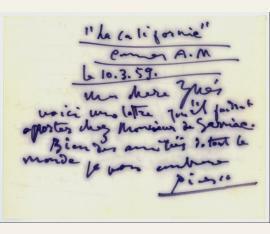 Signed by Picasso in blue ink to the lower light border of the photograph. 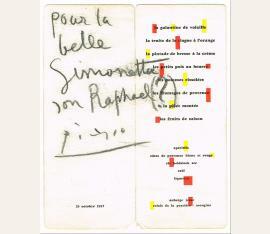 With full provenance explanation to the verso by the restaurant owner where the photograph was obtained in Antibes, 1956. - The French film director Henri-Georges Clouzot (1907-77) directed, inter alia, the documentary film "The Mystery of Picasso" (1956), which was declared a national treasure by the government of France. 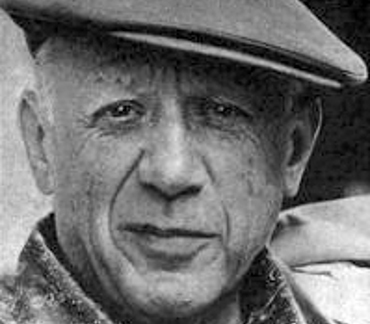 Pablo Picasso (1881–1973), Maler und Bildhauer. Portraitpostkarte mit e. Datum und U. 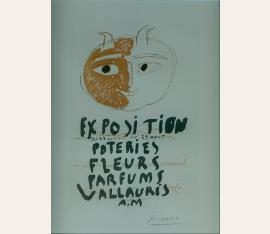 („Picasso“). O. O., 25. April 1958. 1 S. Qu.-8°. – Szenenphoto aus Paul Haesaerts Film „Ein Besuch bei Picasso“ (1950). Pablo Picasso (1881–1973), Maler, Graphiker und Bildhauer. Lithographie mit e. U. 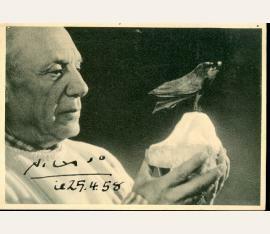 („Picasso“). O. O. u. D. . Ca. 17,78:24,13 cm. Gerahmt. – Gut erhaltenes Exemplar aus Picassos „Exposition Vallauris“-Serie. Pablo Picasso (1881–1973), Maler, Graphiker und Bildhauer. Lithographie mit e. U. 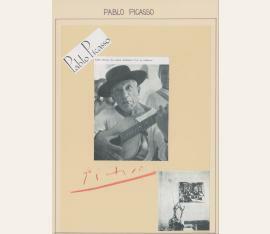 („Picasso“). O. O. u. D. . Ca. 25,4:30,48 cm. Unter Museumsglas gerahmt. – Wohlerhaltenes Exemplar der nach einem Linolschnitt hergestellten Lithographie einer Mutter mit Kind, Tänzerin und Flötenspieler. Farbige Bildpostkarte m. e. U.
Pablo Picasso (1881-1973), Künstler. 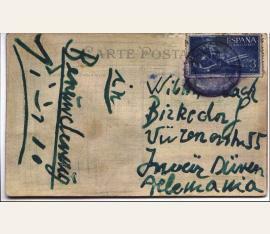 Farbige Bildpostkarte m. e. U., „Picasso“, o. O. u. D. [Poststempel nicht lesbar], eine Seite quer-kl.-8°. Grüne Tinte. An Willi Maubach in Düren. „In Bewunderung | Picasso“. – Nach Informationen des Verkäufers entwickelte Maubach für Picasso ein Verfahren zur Veredelung von Keramiken. – Die Postkarte, in Spanien verschickt, mit Aufdruck „Ce bel oiseau de mer | vous apporte | un Souvenir | de Ploermel“ zeigt eine Brieftaube mit Briefumschlag. Darin befinden sich verschiedene Ansichten der Stadt Ploermel u. die e. Notiz des Empfängers [?] „Andenken von Paplo [!] Picasso als Antwort für mehrere eingesante [!] Zeichnungen“. Lettre autographe signée adressée à Inés Sassier. 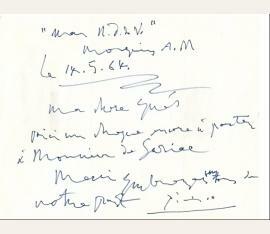 To Inés Sassier: "Ma chère Inès, voici une lettre qu'il faudrait apporter chez Monsieur de Sarrise. Bien des amitiés de tout le monde. Je vous embrasse". - In 1936, Picasso had met Ines Sassier and her sister in Mougins while vacationing with Paul and Nusch Eduard and had brought them back to work for him at the Rue de Boétie apartment. Although Inés had left Paris during the war she returned there to work for Picasso as his housekeeper. For more than three decades, she would serve as Picasso's friend, advisor cook and confidant. Pablo Picasso (1881–1973), Maler, Graphiker und Bildhauer. E. Brief m. U., Mougins, 14. Mai 1964, 1 Seite Qu.-4°. – In Französisch an einen unlesbaren Adressaten.